*Shrek Shrek Shrek, I shrugged my shoulders on Shrek the Third. What’s wrong with it? Nothing really. Why it scored just 41% on Rottentomatoes.com? It’s probably due to one word, “expectation”. There really isn’t anything really new in this third installment about the animated green ogre by DreamWorks Pictures but it is no reason to knock it down. Andy saw the film in the company of children and parents, and felt what the movie is trying to say. Gone is the evil fairy godmother, vanished after being blasted by the magic from her own wand in Shrek 2 and so her son, Prince Charming (Rupert Everett) took over as the core villain. Prince Charming is reduced to a mediocre stage actor who gets booed at every opportunity by his audience. Feeling the victim of the doings by Shrek (Mike Myers), Prince Charming vows to take back what he thought should be rightly his. Meanwhile in the kingdom of FAR FAR AWAY, The King (John Cleese) is dying and he needs an heir to the throne. Who is to be the heir? It’s Shrek of course. But he doesn’t want to be king and seeks out to find Princess Fiona’s (Cameron Diaz) cousin, Artie (Justin Timberlake) to take his place. 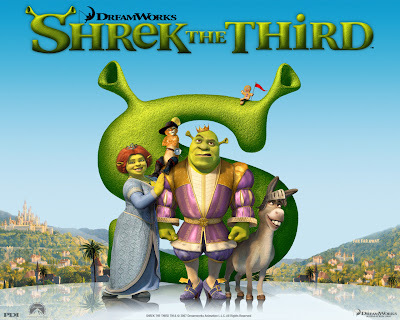 Shrek the Third is about who gets to be King of FAR FAR AWAY. Is it Shrek, Artie or Prince Charming? While that is the main plot of the computer-animated film, the story really is about personal identity, parenthood and the relationship between father and son. There is nothing in the form of spectacular in the film. We’re all very accustomed to what computer-animated graphics can do. I can’t tell the difference to whether the green ogre has one or two pixels more from the first two films. That is besides the point to a family oriented, fun filled movie with jokes and pop music to groove with. It can be 2D for all I care. What is to be appreciated is quite literally not to look at things at face value. That is to put in other words not to judge a book (or ogre) by its cover. It’s cliché but still it’s not taken seriously often enough. Granted it is taken for too many a times. That is why in the first place DreamWorks came out with an ogre in the form of Shrek. He still looks green as usual. One might argue that Shrek the Third is no greener than its first two films. I won’t dispute that fact. We still see the same lovable characters such as Donkey (Eddie Murphy) and Puss in Boots (Antonio Banderas) and the film obviously have stuck itself to a formula that works. Shrek 4 (2010) is on its way to put a “happily ever after” to this non-conventional fairy tale. You don’t need to see Shrek or Shrek 2 to enjoy Shrek 3. It’s as simple to watch as reading a children’s storybook. It gives the children the joy of laughter. Those who should leave the cinema with a grimace on their face probably have issues unresolved. It’s like looking into the magic mirror and asking who is the fairest of them all. It’s not all about seen it and done that. Children are one of those who haven’t, while parents have. That is the message if you can relate and apply. The magic and wonders of a computer-animated film by DreamWorks is on show. What it needs now is to end well with a good Shrek 4 and than tell us all about a new story. Can you make out what those words in brackets mean?